Looking for rock solid stability and dead-on accuracy in a fixed sight? Troy Industries Fixed Battle Sights get the job done. This permanent, rail-mounted alternative to a standard A2 sight allows limitless mounting options on all-length rails with a serrated ramp to eliminate glare. Provides a continuous zero, unflinching durability and peace of mind. 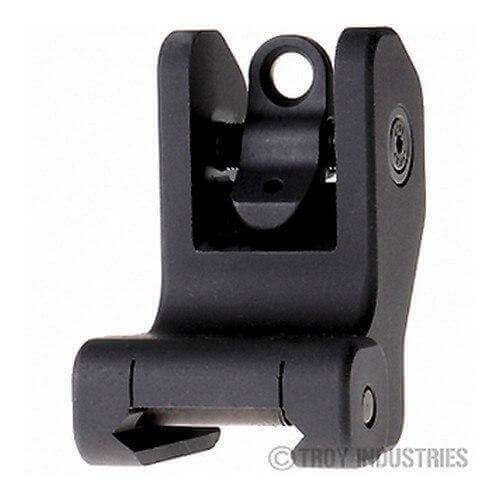 – A permanent rail mounted alternative to a standard A2 rear sight or carry handle. – Provides constant access to fixed sights that continuously hold their zero. – Extremely durable and reliable providing peace of mind. – The most rugged fixed rear sight available. – Hardened T6 aircraft aluminum construction with stainless steel components. – Fits all M4, M16, AR15, AR10 variants and other firearms that have a flat top receiver or removable carry handle. Fit & function per spec, very reliable, thoughtful design. Finish is brown and faded on corners. the fixed sights were great and fit well on my optic ready rifle. However they are prone to corrosion, had to rust bust them 2 days after installation.